One of the more pain-in-the-neck cooking challenges is roasting a duck or goose. Why, you ask? Well both birds have a very large amount of fat under their skin and when they are roasting, this fat melts into the roasting pan. The annoying part is that juices from the meat also drip in the pan. Did you ever see what happens when liquid comes in contact with hot fat, and in this case sometimes as hot as 400 degrees F? It sizzles and spatters everywhere, in this case it's all over the inside of your oven and on the floor as you open the oven to turn the bird during the roasting process. It also creates fatty greasy smells and sometimes even smoke in the kitchen, yikes! This is why most people don't want to take on the challenge and more often than not eat duck when they go out to dinner, and especially at a Chinese restaurant. Who wants the bother? 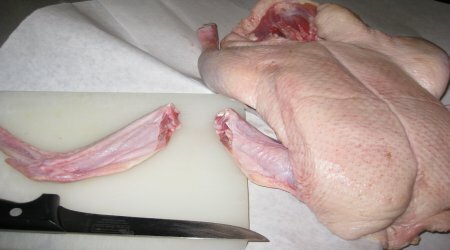 Some cooks will modify the process by cutting the duck into pieces, as legs and boneless breasts; bones are saved for stock. The legs are roasted slightly and then submerged and cooked in their own fat: this is duck confit. The skin from the breast is removed and cooked like crisp bacon. The breast is sauteed and then sliced and served like steak along with some of the meat pulled from the confit leg and crisped skin. Any number of sauces from Bigirade, Marchand du Vin or au Poivre may be prepared and served---it's a real tasty treat cooked this way. More time is required, yet it solves the oven splatter problem. 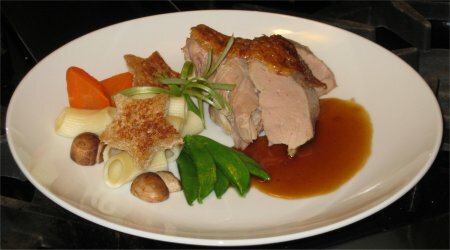 Well what to do if you want a roast duck, and you want to do it at home and you don't want a splattered and messy oven to clean? 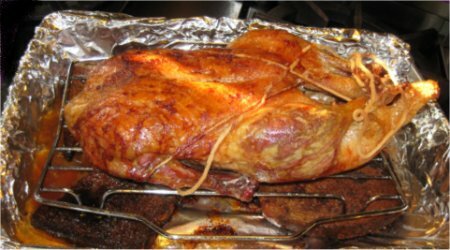 What if you just covered the duck or goose with foil during the roasting? Well, you will have steamed duck or goose and NO crispy skin! My solution isn't completely spatter free but good results can be had and your clean-up won't be too bad. Carving and removing the meat, slight reheating and crisping will be required and you will wind up with a masterpiece for a holiday meal! Less messy roast duck or goose is accomplished with slices of bread and some vegetables lining the bottom of the pan and the use of a wire rack to elevate the bird so it doesn't sit in the fat as it cooks, and therefore develops a crisp skin. You will need: a roasting pan, preferably 17x24 inches and at least 3 inches deep; one wire baking rack that will fit into the roasting pan; a sturdy roasting fork or two to turn the bird; and mirepoix, a blend of 50% chopped onions, 25% chopped carrots and 25% chopped celery. You will need about 2 quarts of mirepoix and it will also be the seasoning for your sauce or gravy. You will also need the secret ingredient: 6 slices of white bread; this will absorb the fat and help control the spattering in the oven. The bread should be discarded after cooking--it's full of saturated fat and to eat it or even give it to your pet would be very unhealthy and probably make you sick to boot! The professional way of roasting poultry or any meat for that fact requires the meat to be "trussed", this means to tie it with twine. There are several reasons to do this but the main reason is to secure it into a uniform shape so it cooks evenly. Another is to have a nicely shaped item to serve to your guests. Some restaurant chefs like to pick the roast up and turn it by the string so as not to pierce it with a fork and let the cooking juices out. 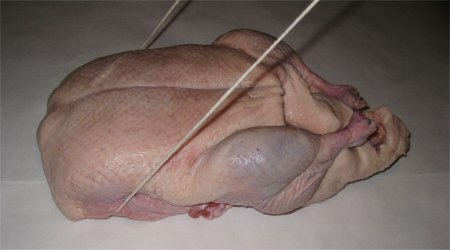 Refer to the following pictures to trim and truss a duck. You can use this technique for all poultry. Although there are many methods of trussing, I have found this one to be easiest to follow, especially for first-time trussers. Prepare the duck for trussing. 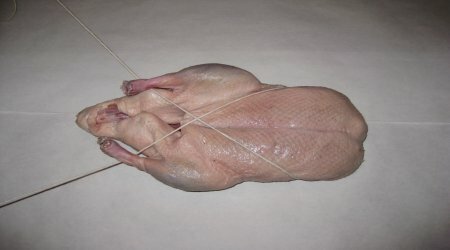 ; remove the gizzard, liver and neck, wash the duck inside and out with cold running water, and trim the wing tips. Why trim the wings? Well they are more valuable for a stock than to eat because there is next to no usable meat on them. Their flavoring and gelatin value is better for a stock. (See the next 2 pictures) The trimmings and everything else except the liver can be used to make a stock. Many chefs saute the liver for themselves for a snack. Use a sharp boning knife for this cut. First feel the joint with a finger and wiggle the wing tip. You will be able to feel the the exact place to cut through---it's where the joint pivots and where the bones are attached to one another. After the duck is trimmed of wings, washed and toweled dry, sprinkle the inside cavity with 1 tsp. salt and 1/4 tsp. black pepper. Insert 1 tsp of a garlic clove cut into 4 lengthwise pieces and a sprig of fresh thyme, 1/2 tsp. of dried if you don't have fresh. Then place it on a clean surface and pat/form it into a uniform shape. 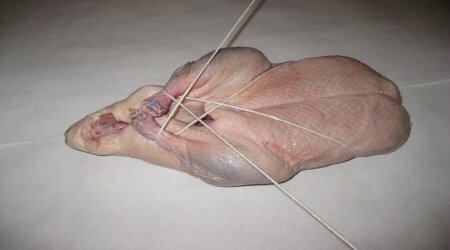 Place a piece of butcher's string under the the duck so it aligns with the remaining wing bones. Holding the strings in each hand, crisscross them and place them under each of the legs and pull taut. Now lifting the strings in a vertical position, cross them again keeping tension and tightness on the string and tying a knot tightly where they cross at the leg bone ends. Cut the remaining excess string and you are almost ready to roast! In a preheated 250 degree oven, yes only 250 degrees, place the duck on a wire rack with the bread and mirepoix underneath. Roast breast side up for 2 hours, turn over and roast 2 more hours. Then turn the duck breast side up and increase the heat to 400 degrees and roast for 35 minutes more. Remove the duck and let cool so you can remove the skin and meat from the bones. Here is the stock simmering! Combine the first set of ingredients and bring to a boil and then reduce to a simmer. Cook until you have the bones available from the roast duck and then add them and cook 1 hour more. Drain and then reduce this liquid, skimming off the fat that rises to the surface as it cooks---reduce to about 3/4 cup of liquid. This reduced liquid is your natural jus to serve with the duck or you can make any number of sauces with it. See the Sauce Bigarade recipe that follows. Oh, what sauce to serve with the duck??? Sauce Bigarade---Traditional orange sauce used in France. 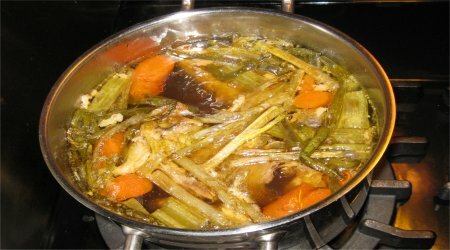 A note about this recipe---If you made and reduced the duck stock you may skip the first set of ingredients and procedure and start with step #2 with the sugar, vinegar and OJ and go from there. Or if you choose, skip the stock and make the entire recipe. In a hot pan over medium heat add the butter, shallots and mirepoix and saute until color starts add the thyme, bay leaf, and peppercorns and chopped duck bones. Saute together until golden brown. Deglaze with red wine, add demi-glace and veal stock---bring to a boil, reduce heat and simmer 10 minutes, skimming as needed. Thicken with roux and simmer 20 minutes longer. Season with salt. While simmering, caramelize sugar with vinegar, add OJ and lemon juice and reduce by 2/3, about 3 ounces liquid should remain when finished. Keep warm and covered with plastic wrap. Reduce the Grand Mariner by half, burning off the alcohol. Strain the brown duck sauce into a clean pan and add the sugar, vinegar and juice reduction, then the reduced Grand Mariner. Whisk in the butter and add the zests. Serve with crisp roasted duck or sauteed duck breast. It takes a lot of time to make this sauce but it is worth every drop! The duck was placed in a roasting pan lined with slices of bread and on top of a wire rack to keep it elevated above the cooking juice during the process. After spending the allotted time in the oven, the mirepoix was removed from the pan and added to the duck stock for additional flavor. 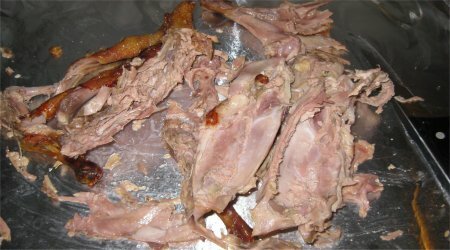 The following pictures show the finished roasted duck with the bread that absorbed the fat. In addition all of the meat was removed from the bones, the bones added to the stock and cooked more and then strained to become sauce. 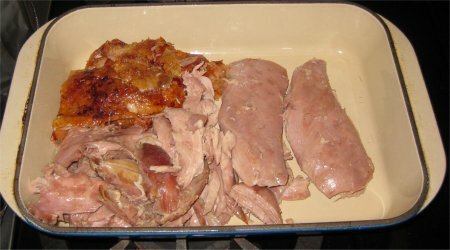 The duck meat was cooled and then slowly reheated, the skin was also saved and re-crisped. At serving time the meat was divided equally among 4 people with each person receiving 1/2 of a breast, some leg meat and very crisp skin. The reduced stock was cooked to a syrupy glaze and served on the side. The duck or goose is cooked ! Here are some pictures of what now happens to get it to the table. The finished roasted duck with fat-absorbed bread slices. The bones for stock after the meat was removed. The totally fat and sinew free duck meat with skin for reheating. With a few vegetables, the Bigarade sauce, and reheated duck, you are ready to serve your guests. Rather than serving family style, I plated each friend's plate in the kitchen simultaneously and then rushed them to the table. What looks like stars are cut out from bread slices (not the ones from the roasting pan!) with a star shaped cookie cutter--they were toasted in butter and added to the plate as a conversational and cute garnish! Delicious with Pinot Noir, beer or even water!